ONLY a miracle – and the determination of rescuers – saved boy soldier John Stevens when he became trapped underground 36 years ago. The 16-year-old had been ordered to plunge into a water-filled passage with no exit during a training exercise. After diving 90ft along the tunnel, John discovered an air pocket, but had no chance of finding his way back. Everyone assumed he had perished, but cave rescuer Dave Allsop and his team battled on and after 13 hours, they reached the young cadet and led him to safety. John and Dave shook hands above ground and never saw each other again. But this week, John, now a 52-year-old grandfather, had a heart-warming reunion with his rescuers and revisited the Peak District pothole which nearly claimed his life. John was on an Army initiative test on July 7, 1965, and dressed only in jeans and a sweater when he dived into the dark, freezing water – experts believe it could be the longest free dive in caving history. By chance, he found an air pocket, but in the darkness he had no idea how to return to his party. Members of the Derbyshire Cave Rescue Organisation, led by a then 28-year-old Dave, soon came to the conclusion they were looking for a dead body. 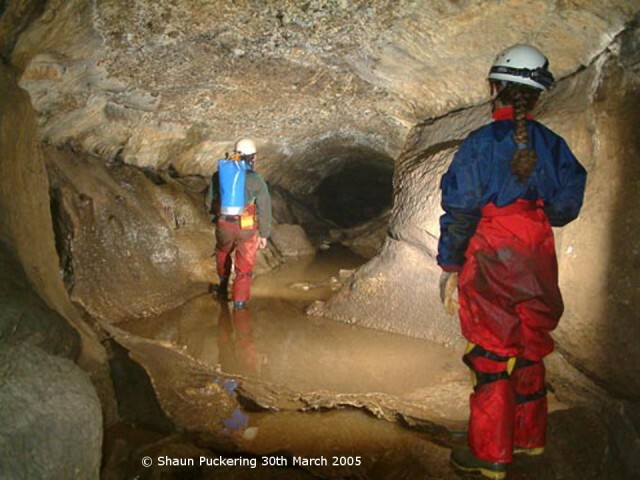 For 13 hours, they searched Carlswark Caves, Stoney Middleton, near Buxton, and pumped water from the passage before they found John. John’s daughter Ceri Murray grew up knowing she and her father owed their lives to those dedicated rescuers and has spent years searching for information on her father’s adventure. ”We had all the original newspaper cuttings, but they were lost in a fire 20 years ago,” said Ceri, 29, who lives in Stevenage, Herts. Finally she found Dave’s story of the rescue on the Internet. ”It was really quite emotional and overwhelming when I found it,” said Ceri. Together, they organised the surprise reunion. Ceri brought her father, two-year-old daughter Paige and other members of the family to Derbyshire and Dave got the rescue team together. John, now an electrician who lives in Welwyn Garden City, was stunned to meet his rescuers and to return to the cave. Dressed in a new pair of bright orange overalls and helmet, he went back underground at Carlswark Caves to the watery sump where his epic dive started. ”I didn’t realise how lucky I was,” said John. ”Going down there brought back a few ghosts and the memories of exactly what happened. ”You forget the arrogance of the people who controlled us. ”The guy had to be off his trolley to send a 16-year-old boy down there. ”I had been in three times. I kept coming back to say it was flooded and he said it couldn’t be and to get back in there. ”The only reason I survived was I swam for the Army. Every morning I would swim two lengths under water as my first bit of training. ”That whole experience changed my attitude to people in authority. From that day on, I questioned if they were telling me the right thing to do or not. Even after all these years, Dave is amazed John survived. ”It might be the most remarkable dive in history – I knew the passage, so I thought we were looking for a body,” said Dave, who led a team which broke the world pot-holing depth record in the French Alps in 1962.